If you are a fervent computer user for a greater management purpose, then even a single day without computer would be a total disaster in your list of schedule. Now there are many implications which can lead to such scenario and forgetting or losing admin password by personal negligence or error is one of them. It is quite common when you stop entering your system for couple of days and then when you enter it is total black out of your memory as to password recollection. All your everyday needed files, documents, phone list, salary details, everything are stored in your system. Sudden lock out is really havoc for every user. But don’t worry; this is why we have come to help you to unlock your Windows 10 screen login password on computer. 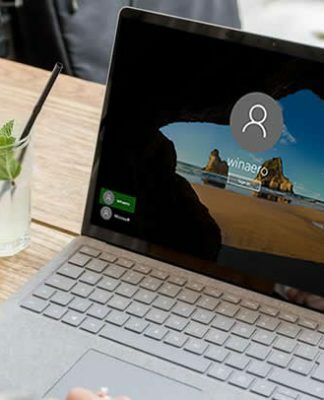 Thus, this article will demonstrate you few simple guidelines to help you unlock Windows login password protection feature so that you can access your account without losing data. If you had earlier created a Reset Password disk before actually forgetting the password, then this is the right time to bring the ace of card to play to deal with the situation. Step 1. Insert your USB stick comprising the password reset files and documents into the locked Windows Vista computer and reboot the system. Step 2. On the login screen, you will get to see a field named “Reset Password” under “Username” section. Click on it to proceed. Step 3. 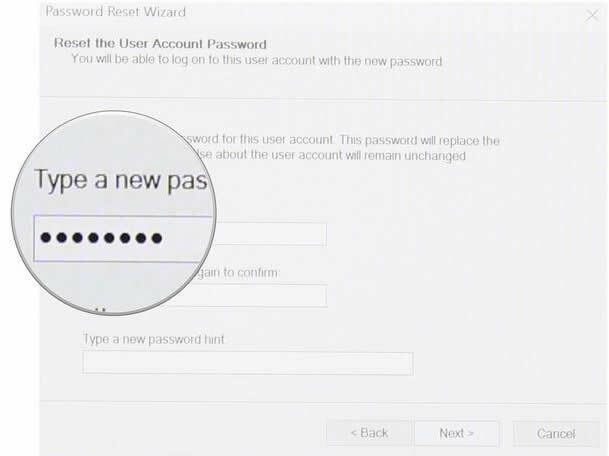 Once the new password wizard turns up, simply click “Next” option to proceed. Step 4. Next select the USB drive name where the password reset disk is saved and shift to the next page. Now here type in your new password and save the changes. And that’s it! Now restart your computer and enter your newly password to access the previously locked account. Mostly the users are not fully aware of password reset disk, thus it remains unused. This method would only work if you had created a password reset disk in the first place before you had forgotten the password to your system. 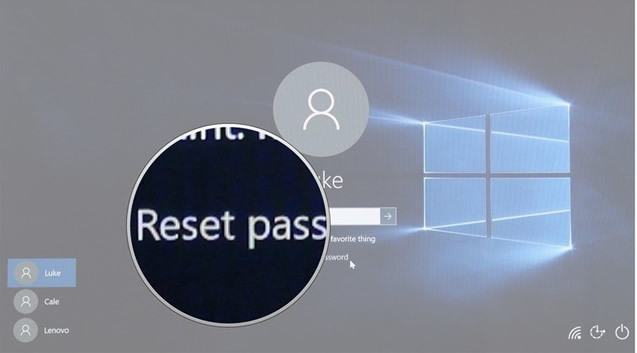 Don’t miss: 4 ways to reset forgotten Windows 10 login password. 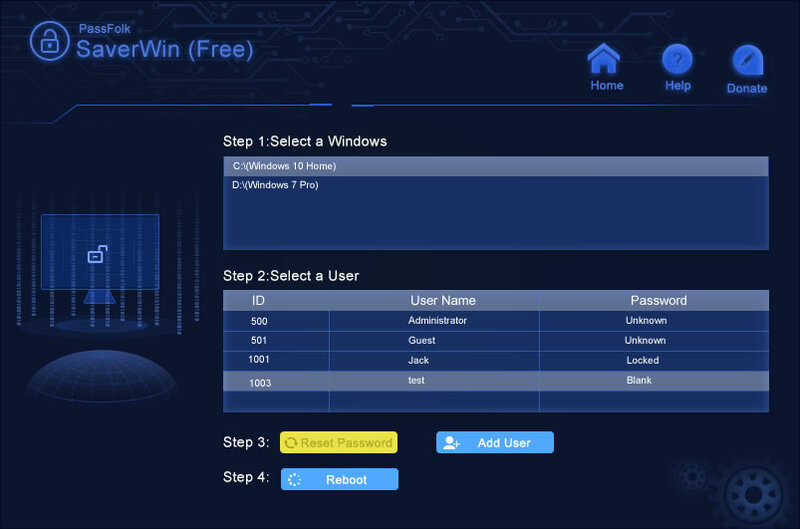 PassFolk SaverWin (Free) is an astounding but a 100% free windows password unlocker tool which can actually alleviate you off the futile attempts with other password resetting tools. The interesting part is that instead of resetting any password, it actually provides you the opportunity to modify the SAM file which stored your all password, then reset the SAM file to blank, it means that the password was cleared. And there is no loss of data at the same time. Due to its phenomenal performance it has gained a lot of popularity in the last few years. Read few of its specifications to know the tool in detail. It is operational with Windows desktop and laptop: Windows 10/8/7/XP/Vista and Windows server versions, such as 2018/ 2012/ 2008. 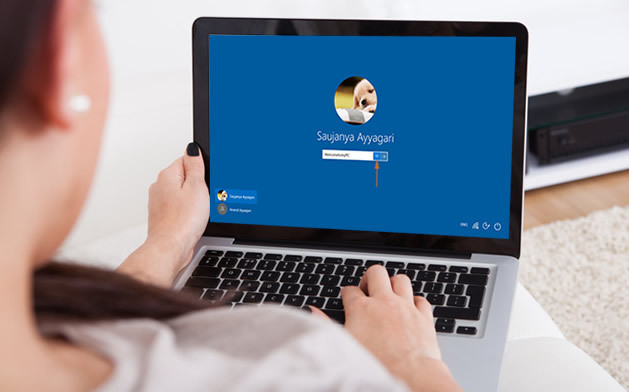 Unlock all types of accounts: Administrator, user password, guest password, Windows server. Make bootable reset disk from USB, DVD/CD. No convincing skill are not required if you are beginner. Step 1. Make sure to download SaverWin program file compatible with your 64 /32 bit version of OS and install it correctly. Open the tool with admin rights, and from the main UI interface choose “USB or CD/DVD” as the media type. Step 3. 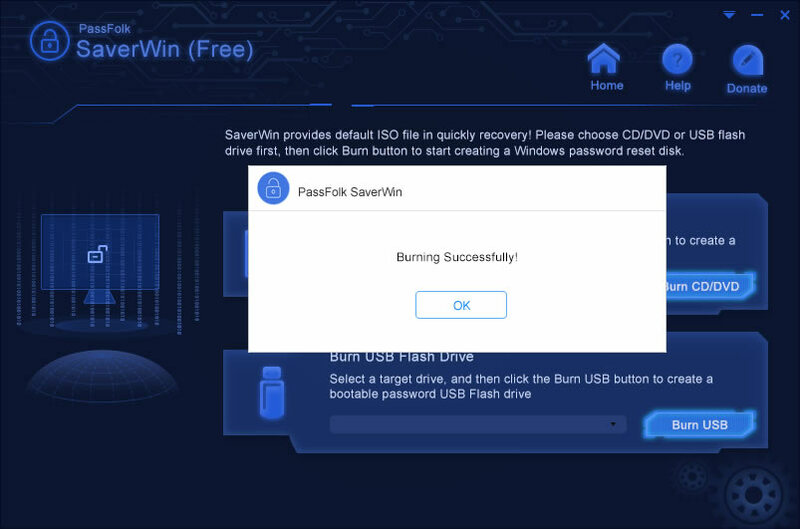 Now insert your completed empty and formatted disk into the computer and click on “Burn USB” to commence the burning of ISO image files. Finally click “OK” to finish the process. Step 4. 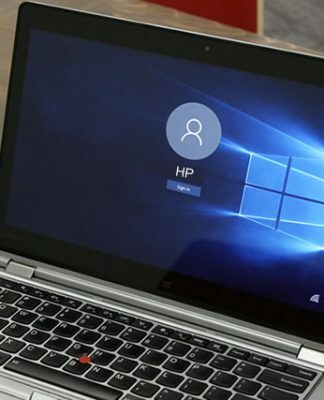 Remove the disk and re-insert it into the locked Windows computer and change the boot preference order to boot from it. 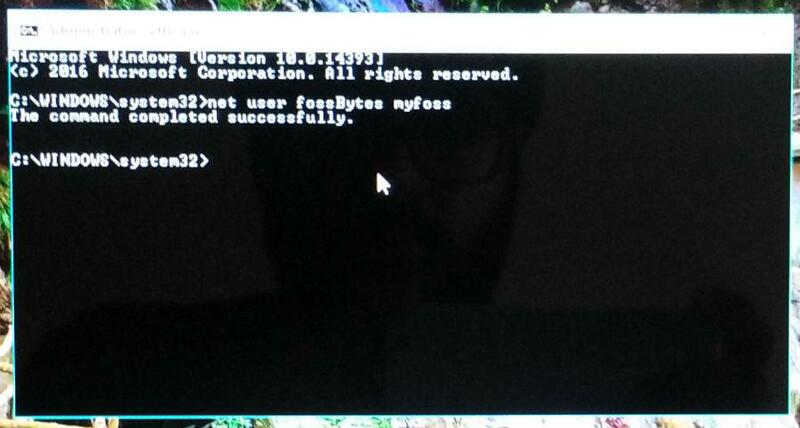 Try to repeatedly press F2, Del or F8 key to enter the BIOS settings, then choose USB or DVD/CD in the booting list. Step 5. Next choose your locked user account and click “Reset Password” and then “Reboot” options to begin the process of password removal. Step 6. The system will be restarted but this time there shall be no password prompting like before which shows that the password protection has been completely disabled. Step 1. Create a bootable USB or CD/DVD and plug it into the computer containing the locked admin account. Step 2. Choose your preferred language and click on “Troubleshoot” option. Step 6. Replace the “username” with the locked account username and the “Password” with the newly generated password. Voila! Your task is done and now your locked account can be opened with the newly created password. Even a slightest mistake with the commands can render serious damage to the system, thus it is a very risky approach for beginners. If you are not familiar with the cmd commands, better not use it to avoid any further mishap. Doesn’t work for UEFI-based computer. As you can easily comprehend from the above discussion in the article that the PassFolk SaverWin is the only suitable utility to deal with your situation, so now you can completely rely on its authenticity. Other third party tools have got a lot demerits and setbacks which make them secondary as an option to choose while your system is heavily compromised. But we highly suggest you make a reset disk in case you forgot your password again in the future or make a note of the password. Offline NT Password & Registry Editor Not Working, What’s the Best Alternative? How to Fix Windows File Explorer Not Responding Issue on Right-click? Next articleHow to Take Screenshots in Windows 10? 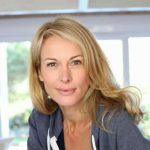 Joanna is a senior editor for PassFolk, covering laptops, Windows, Android and freeware. She loves technology in all its forms and reviewing technology and software since 2015. 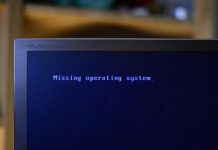 How to Fix the “Missing Operating System” Error? How to Force Uninstall a Program that won’t Uninstall? 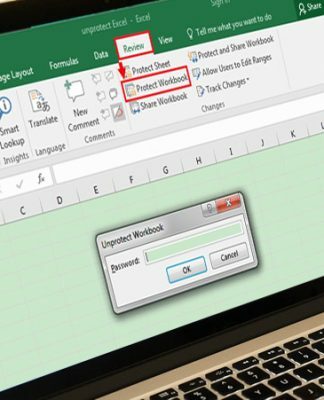 How to Open Password Protected Excel Files 2007/2010/2013/2016? 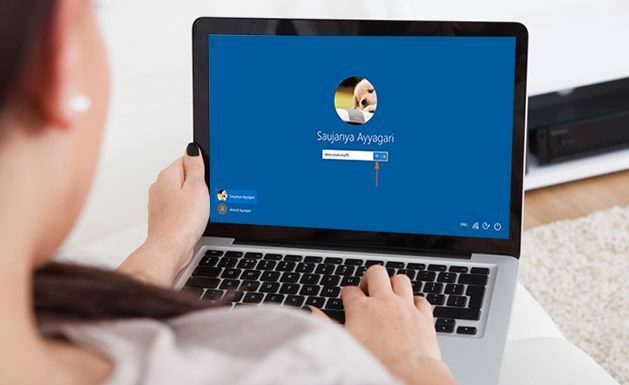 How to Crack Windows 10/8/7 Login Password without Losing Data? How to Fix Blue Screen of Death in Windows 10? How to Fix “Windows Can’t Add PIN Code” Error? Forgot HP Laptop Login Password – How can I Reset? PassFolk is a resource where you can find the latest tutorials, tips and tricks about computers, Android, iOS and other electronics gadgets.